The following information came from the book The River That Isn’t: A Tale of Survival and Prosperity by Garvie Samson. You can buy the book online from John W. Doull Bookseller by clicking on the highlighted book title. River Bourgeois is situated in Cape Breton, Nova Scotia along route 4. 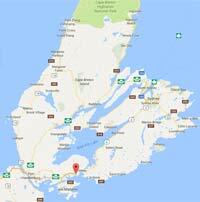 The community is 48 kilometres (30 miles) east of Canso Causeway and 6.4 kilometres (4 miles) west of St. Peter’s. River Bourgeois was settled in 1714 when 24 Acadians were given permission by Louisburg to settle in River Tillard. In a survey of Cape Breton in 1811 there were 19 families in River Bourgeois with the last names of Landry, Samson, Dugat, Bourque, Boucher, Fougere, Pitre, and Babin. The number one industry was brick manufacturing followed by fishing. 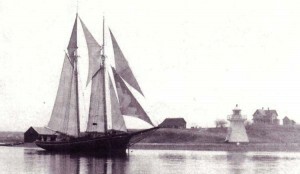 The earliest boat construction was in 1810 called the Morning Star. Full time farming began in the late 1800’s. Blacksmiths were first recorded in 1882 and the first forge in 1888. The Lobster cannery was established in 1911. The first steam-powered sawmill was opened in 1918 and the water-powered sawmill was opened in 1931. 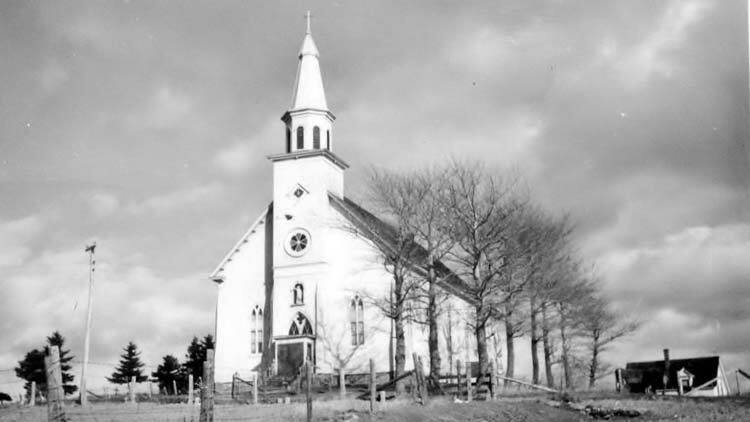 Saint John the Baptist church was opened in 1868. Saint John the Baptist Catholic Women’s League was established in 1953 under the Spiritual Direction of Father Flavian Sampson. Les Filles de Jesus order of nuns moved into the Rectory in 1954 and taught until 1967. The Stella Maris school, later named River Bourgeois Consolidated. River Bourgeois had two schools, the East End School (1887) that was destroyed by fire in 1889 and rebuilt the following year, and the Cannes School (1888). Both of these schools closed in 1954 with the creation of a newly built school, the Stella Maris School. 1954 was also the year River Bourgeois had its first school bus, driven by Davy Touesnard. There were 230 students when the school opened in 1954 and 28 students when the school closed in 1994. Mail was first delivered in River Bourgeois in 1838 by boat from Canso. There were two Way stations (mail delivery locations) established in 1845. The oldest post office was on the Church Point, built in 1879. Cannes post office opened in 1884, the Southside post office opened in early 1900, and the Hawker post office opened in 1928. The first telegraph office was opened in 1917. On October 1947, 20 households contained the first battery operated phones. Phone owners paid 5 cents per call within River Bourgeois and 10 cents for calls to St. Peters. Those who did not own a phone would pay double to make a phone call. In 1974 dial phones were installed. The power was available in 1939. Cost was $50 for wiring a house. In 1968 road lights were installed. There was no medical available in Richmond County until 1830 so residents had to rely on the use of local remedies. With the improvement of roads in the late 1800’s and early 1900’s residences were able to seek doctors by horse and carriage or horse and sled. The first recorded doctor was in 1866 an he was located in St. Peters. With the installation of phones it became quicker to get help. Midwifery was used extensively in River Bourgeois. In 1917 Hermit Medications was opened in River Tillard and it labeled its product “Hermit Medicine Company”. 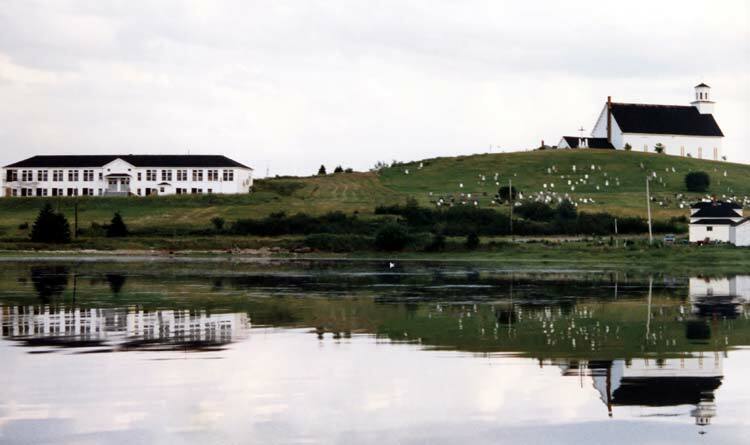 The building was torn down in 1993 and a replica built on the property. The first recorded general store was in 1866 operated by Frederick Bissett. Frederick’s brother operated a salt/fish supply store in 1862. The Levesconte store was built after 1879 and was located at the government wharf where patrons could load and unload goods at high tide. Coffin cloth was among some of the wares sold. The MacNeil store on the Church Point opened in 1880 and sold yard goods. Boyd’s store was opened in 1882 and was selected as a Indian agent for the Micmac Tribe. Schooners landed their goods at the wharf where it was stored for their customers. The government leased part of the wharf for shipment of goods between Halifax and Boston. The store closed in 1975. Katie’s ice cream parlor operated from 1920 to 1937 and was a local hangout. River View quick lunch operated from 1933 to 1962 by Charlie Grimes. Gerard Touesnard opened the first gas station in 1947. The lighthouse began operation in 1903 and was attended by a lighthouse keeper for the sum of $90 per year. In 1966 electricity replaced the kerosene light. 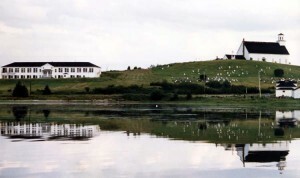 In 1989 the lighthouse was replaced by a Skelton Tower and the original lighthouse burned because of the cost of maintenance. An exact replica was built in 2003, 100 years after the original. Tara Lynne Touesnard, an accomplished violinist, was killed in a car accident in 1994. The River Bourgeois Community Hall was renamed the Tara Lynne Community Center in her honor. Mike MacPhee played NHL hockey for the Montreal Canadians from 1985 to 1993 and the Dallas Stars for two years. Mike played for the Montreal Canadians when they won the cup in 1986. Road signs were erected in his honour in River Bourgeois in 2010. Gordon Gilles, a notorious chef, won several culinary awards and was the Executive Chef at Government House in Halifax and cooked for many royals including Princess Anne. Johnny “The Diver” Sampson became famous because of his profession. He was a pioneer in using dynamite underwater and repairing damaged vessels. Marie Boyd was a school teacher who became famous as the originator of the River Roundup and the letters she wrote to all the soldiers from River Bourgeois who were overseas fighting the war.